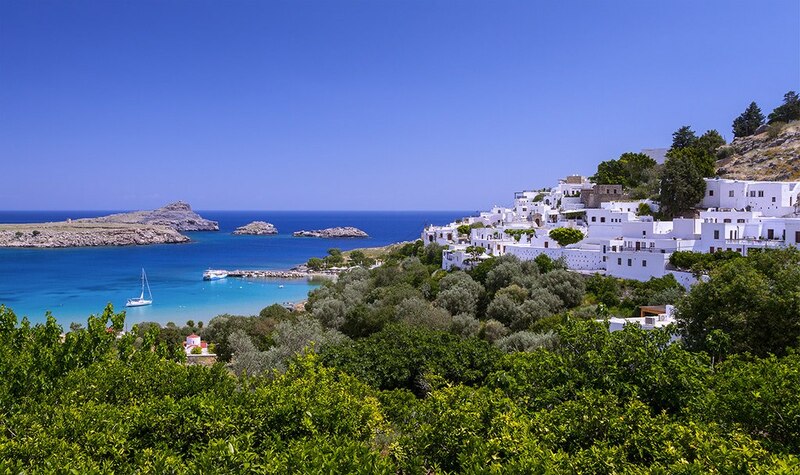 Lindos swarms with tourists in the summer months, all thronging to see this most picturesque of Rhodian villages. Lindos is set into a hillside and is flanked by several wonderful beaches, three harbours, the sublimely lovely St Paul’s Bay to its south, and the awe-inspiring Acropolis and Knights’ castle atop of the 105 m. (350 ft) high crag that looks over the village and is visible for miles around. The alleyways teem with shops offering porcelain, woven rugs, leather, jewellery, pottery, lace, and paintings, their sun blinds forming a canopy over the alleys that keeps the searing summer sun out, but has the effect of creating the largest sauna in the world. Lindos is famed for its marvellous Captains’ Houses, built by wealthy seafarers whose amassed fortunes facilitated the construction of these unusually decorated domiciles, some preserved as they were, some now bars or private dwellings. Hokhlaki floors are ubiquitous here, and the best examples are to be found on the front steps of the Captains’ Houses, as well as on the interiors. Many of the restaurants are perched upon 3- or 4-storey balconies, offering superb views of the azure Aegean and the constant comings-and-goings within Lindos’ main harbour. Ancient archways are still to be seen, although many have now been covered or integrated into more recent developments. There are influences here of Venetian, Roman, Byzantine, Moorish, Saracen, and Ottoman occupation, all of which serve to give Lindos its distinctive flavour and atmosphere. There are several ornate churches in the village, most open to the visitor. Stop awhile at one of the dozens of tavernas and bars that line the alleyways, all offering decent food at keen prices, and whilst waiting for the bus to take you back to your resort, relax in the shade beneath the huge olive tree that is centre-stage in the village square. Lindos is very, very busy during the summer months due to its reputation of being the island’s second-most-visited location behind Rhodes Old Town. We found it best to visit after 3pm, when the majority of the tour coaches had departed from the village. As with anywhere on Rhodes, it is very hot, and this is exacerbated by the shops’ blinds that cover the alleyways. We certainly found prices to be a bit higher than in some resorts, but not extortionately so. The large, flat area besides St Paul’s Bay is often used for open-air concerts, and during our stay, a Pink Floyd tribute band played a stunning set, according to some friends who attended. The walk from the main car parks is steep in places, with no real footpath for pedestrians. Taxis race up and down the hill with inches between them and the tourists, so caution is definitely advised. Lindos is situated just off the main east-coast road between the villages of Kalathos and Lardos, with two large car parks adjacent to the village. You can take the lane down into Lindos to the small car park about 100m from the village square, but this fills rapidly. Parking in the square is only for taxis, and a barrier is operated by a whistle-yielding female warden who will turn you away with a blast on her whistle and a dose of vernacular Greek. Buses services run to Lindos from all over the island and are inexpensive and frequent, although not always on time. Taxis will often stop for you if you are walking or awaiting a bus and ask if you want to share with the existing occupants, an unusual way to make friends, that’s for sure. Lindos itself is traffic free due to the narrowness of the alleys, although this doesn’t deter locals from screaming around on their derelict mopeds and scooters. Every tour operator offers trips here, but book your trip with an independent travel firm, which will be at least 15% cheaper for the same trip.